One Viennese photo a day. 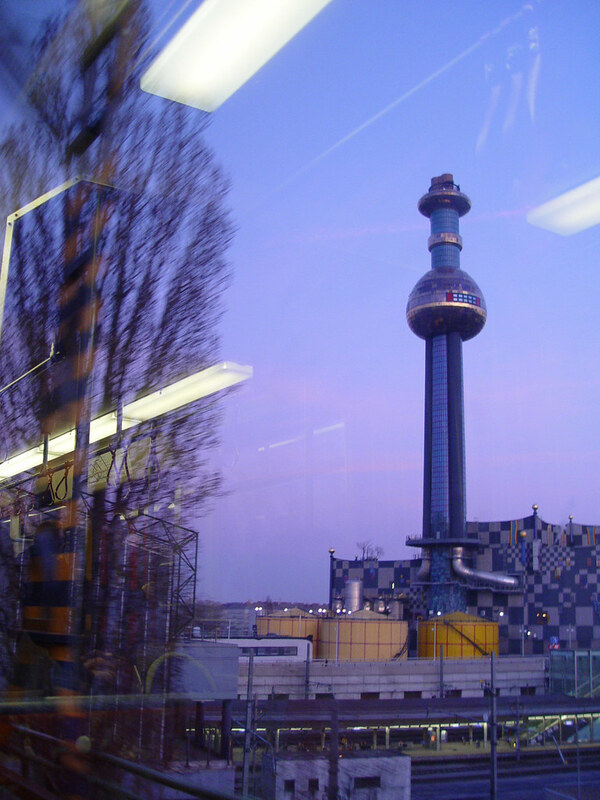 Hundertwasser 's art at dusk - View from inside a moving train. The Fernwärme Wien is one of the most notable structure in Vienna. Aside from the smoke that it emits through Vienna's skyline, the design and architecture is really noticeable. It is a garbage incinerator and heating plant. Yes, it is a process that disposes off wastes in a clean manner that recycles energy providing more than 225,000 residential and commercial customers (that was in 2001) with heat. The heating plant is located in Spittelau, which can be reached by the U6 or U4 lines of the underground. 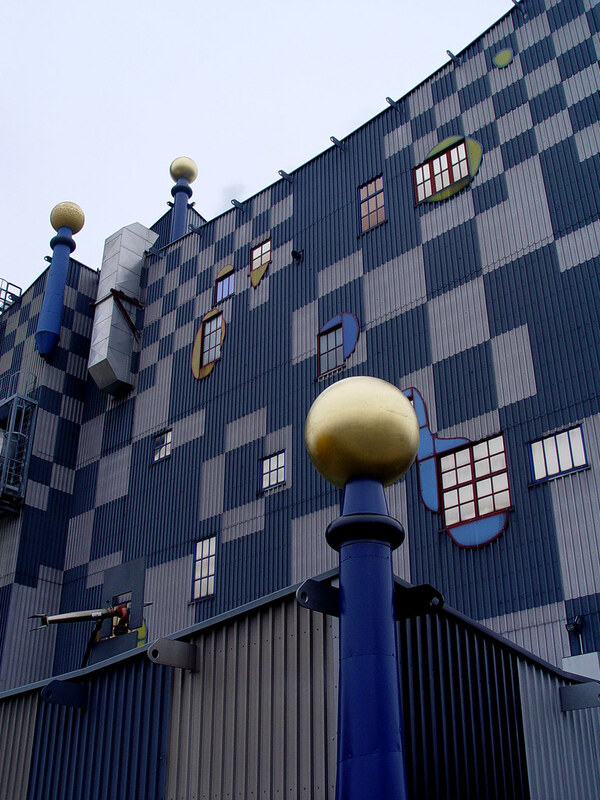 The structure was designed by Austrian painter and architect, Friedensreich Hundertwasser upon the persistence of then Mayor Helmut Zilk. 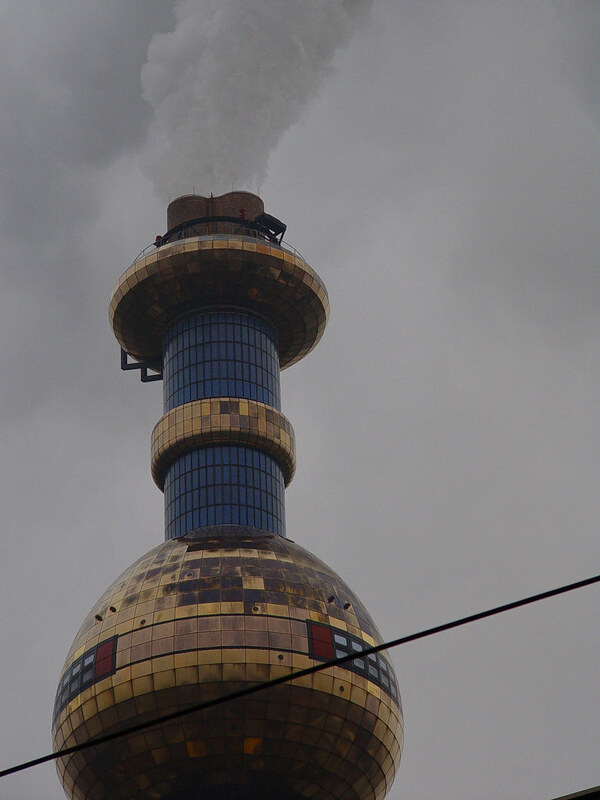 Hundertwasser was reluctant at first as he has objections about waste incineration. He later on agreed as it was promised that the most modern emission-purification technology will be equipped in the plant. As his trademark, the building was made colorful with uneven windows and golden domes. thanks for visiting my blog and thanks for the advise about enlarging the photos. you have lovely photos. will be back again. I haven't seen too many garbage incinerators, but this one has got to be one, if not the coolest looking one. The reflections in the window add a nice touch to your photo. They were just finishing construction on this plant, I think, when I left Vienna. I love Hundertwasser! I use to ride past the famous Hundertwasserhaus at least once a week on my way to church. I still have to go there and photograph them Janet, lol...been here 5 years and no fotos of the houses...=D When you come by again be sure you see the plant ayt? This is a rare winter morning when the sky is beautifully painted blue and not so grayish - opposed to yesterday's situation.